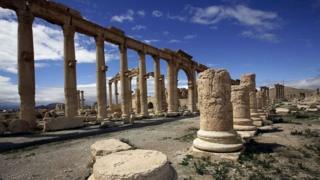 Islamic State (IS) fighters in Syria are said to have seized part of the town next to Palmyra, one of the Middle East's greatest archaeological sites. Pro-government forces have evacuated local residents and are confronting the militants, Syrian state TV reported. Activists say IS holds much of north Tadmur after overcoming militias loyal to President Bashar al-Assad. Syria's head of antiquities said the world had a responsibility to save Palmyra, a Unesco World Heritage site. Hundreds of statues had been moved to safety, but large monuments could not be moved, Maamoun Abdul Karim warned. IS militants have ransacked and demolished several ancient sites that pre-date Islam in Iraq, including Hatra and Nimrud, leading to fears that it might attempt to damage or destroy Palmyra. On Wednesday, the Syrian Observatory for Human Rights, a UK-based monitoring group, said a third of Tadmur had been taken by IS after battles with government soldiers and allied militiamen. "People are very afraid of what will happen, because IS has the capability to get to the heart of Palmyra," an activist in the town told the AFP news agency. Rising out of the desert, Palmyra contains the monumental ruins of a great city that was one of the most important cultural centres of the ancient world, according to Unesco, the UN's cultural agency. The site, most of which dates back to the 1st and 2nd Century when the region was under Roman rule, is dominated by a grand, colonnaded street. "The fighting is putting at risk one of the most significant sites in the Middle East, and its civilian population," she said in a statement. Palmyra and Tadmur are situated in a strategically important area on the road between the capital, Damascus, and the contested eastern city of Deir al-Zour, and close to gas fields. Taking control of the area would therefore be an important strategic gain for IS, says BBC Arab affairs analyst, Sebastian Usher. But the world's focus is on the ruins and IS has taken pleasure in devastating and destroying similarly priceless, pre-Islamic archaeological treasures in Iraq, condemning them as idolatrous, he adds. A US-led coalition has carried out air strikes on the jihadist group's positions since September 2014. However, it says it does not co-ordinate its actions with the Syrian government.